This meeting room is the larger room on the left side upstairs on the gallery of Bogen D at Viadukt. 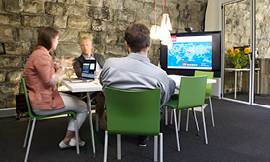 It can be used for meetings for up to 10 people, e.g. 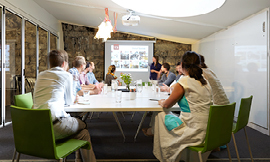 for a brainstorming session or creative seminars. 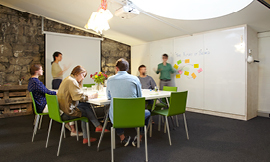 The room is separated from the smaller meeting room V2 by a semi-transparent glass wall. • Office Box with Post-its, pens, etc. Cancellation policy: Free of charge minimum 48 hours prior to the event. Afterwards, 50% of the costs will be charged. Catering: Check out our Catering Packages! Tips: Place your Catering order while booking your room through our Booking Tool! The event space includes the complete Bogen D at the Viadukt with the two meeting rooms V1 and V2.